Daniella DeGeorge, a UNCG psychology alumna who graduated in 2013, is currently the project manager of a National Institute of Drug Abuse (NIDA) funded research study at the University of Maryland. The study examines the efficacy of behavioral activation therapy that is aimed at improving depression and substance use among low income minority drug users in Washington, DC. Daniella honed her research skills in several labs during her time at UNCG, taking advantage of many opportunities to work one-on-one with our faculty. She conducted research with Drs. Boseovski, Marcovitch, Kwapil, and Sahakyan. Her research collaboration with Dr. Kwapil resulted in first authorship on a research report of a longitudinal study that investigated affective temperament and psychopathology risk (DeGeorge, Walsh, Barrantes-Vidal, & Kwapil, 2014). Daniella’s long term plan is to earn a PhD in clinical psychology and she will begin the application process this fall. 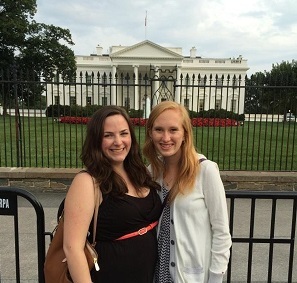 In this photo, Daniella (left) catches up with our current Psi Chi President, Alyssa Mielock, during some down time at the American Psychological Association Convention in August, 2014.